The condition was diagnosed as an external hordeolum. The physician recommended that she apply warm moist compresses to her eyelids 4 times a day. Her hordeola resolved within 7 days. 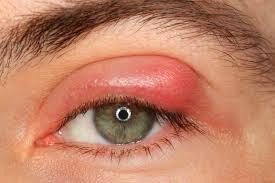 Introduction: A hordeolum is an acute painful infection of the glands of the eyelid, usually caused by bacteria. Hordeola can be located on the internal or external eyelid. Internal hordeola that do not completely resolve become cysts called chalazia. External hordeola are commonly known as styes. Infection in the meibomian gland causes internal hordeolum, often resolves into a chalazion. • Staphylococcus aureus is the causative agent in most cases. Chalazion is a nontender nodule on the eyelid. In case of Hordeolum tenderness and erythema are localized to a point on the eyelid and conjunctival injection may be present. • Hidrocystoma—Benign cystic lesion that grows on the edge of the eyelids and is filled with clear fluid . • Xanthelasma—Yellowish plaques, generally near medial canthus. • Molluscum contagiosum—Waxy nodules with central umbilication; generally multiple. • Sebaceous cell carcinoma—Rare cancer seen in middle-age and elderly patients; difficult to distinguish from recurrent chalazion or unilateral chronic blepharitis without biopsy. ~ Warm soaks, 3 to 4 times a day for 15 minutes, will elicit drainage in most cases. ~ Topical antibiotics (e.g., bacitracin ophthalmic ointment) may be beneficial for recurrent or spontaneously draining hordeolum. ~ Cases that do not respond to warm soaks or that are extremely painful and swollen may be incised and drained with a small incision. ~Systemic antibiotics are usually not needed unless patient has preseptal cellulitis. ~ Chalazion can be treated conservatively with lid hygiene and warm compresses. Warm compresses can be applied 2 to 3 times daily but may take weeks to months to work.